De Ommuurde Tuin is the historical kitchen garden of King Willem III. Nowadays it is one of the most beautiful organic gardens of the Netherlands, owned by Esther Kuiler since 1999. She grows more than 400 varieties of organic vegetables, herbs, tubers, edible flowers and fruits on less than one hectare. The garden is a CSA (Community Supported Agriculture), which stands for a closer connection between consumer and producer. In the Netherlands CSA’s are often ‘harvest-it-yourself gardens’, but another example is a direct link via a membership. That’s nice for the farmer, since you pay up front, so that the producer can use this money to invest in seeds, compost, manure, tools etc. Also, there is a shared risk: when the harvest is good, you get a bit more – and when the harvest is less good, the beets and carrots will be a bit smaller. You can become a member and get a veggy bag every week (including a nice recipe – good to practice your Dutch ;)), or buy your organic vegetables at the farm shop. From May until October the garden shop is open every Wednesday and Saturday from 10:00 – 17:30. It’s the place to be to buy delicious local, seasonal vegetables, herbs, tubers and fruits freshly harvested that morning. But there’s also a terrace where you can enjoy organic coffee, (fresh herb) tea, self baked cakes, or try out our famous lunch dishes: self-made soups, quiche or salads with veggies from the garden. In the shop you can also find interesting books, honey from the bio dynamic bee keeper Wim van Grasstek, ‘bee hotels’, tea, jam and more..
Would you like to have organic fresh, seasonal veggies and herbs directly from the land? Do you want to get to know more than 60 varieties and nice recipes how to prepare them? Join the garden as shareholder! We are an example of Community Supported Agriculture (CSA), with a direct link between producer & consumer. Why CSA? At the moment, we are losing 22 farms every day in the Netherlands alone (Boerengroep, 2017). Since 1950 up to now, 6 out of 7 farms are gone. The reason is very often not the lack of technologies, bad yields or lack of infrastructure. It is because prices go up (e.g. one hectare of land costs 80.000 euro's), while the price that farmers receive for their products are decreasing more and more - sometimes even below the cost of production. One way to make a living from agriculture, is via CSA, where the farmer can ask a fair price and that money goes all to the farmer (and not mainly to the supermarket concerns). How does it work? You pay up front, in the beginning of the season, which makes you owner of a part of the harvest throughout the year. As a shareholder, you then receive your share of the harvest, from May until November, every week in a veggy bag, which you can collect in the garden or at pick up points in Wageningen. in total, you will receive around 60 varieties of veggies, tubers, herbs and some fruit with nice recipes (in Dutch - so it's even a language course ;)). CSA also entais a shared risk: when we face challenges (e.g. because of drought & heat), you receive a bit less and when harvests are good, you'll receive more. In this way, we - as a community - work together on the continuation of sustainable nature inclusive farming. Boerengroep intern Ivy (Ghana) works along in the garden to learn about Community Supported Agriculture. She wants to introduce this concept in Ghana in order to improve the income of farmers. Would you like to complete your (theoretical) study with some hands on experience? Or you simply like to be outside in a garden a bit more? Join the volunteer group! We work with a team of volunteers, including some English speaking students. You’re welcome to join the days and amount of hours that fits your schedule, yet we prefer that they are fixed days, so we can manage the amount of people working per day. It's also possible to become an intern for one or two full days a week. As an intern the focus is to learn about several concepts, like agroecology, crop rotation, the soil, diseases & prevention, sowing, planting, weeding, harvesting, adding value to products etc. You'll also learn more about the concept of Community Supported Agriculture (CSA) and how to make a living from one hectare vegetable garden. Most interns from WUR in de Ommuurde Tuin conduct their internship with Boerengroep - working in the office 2 or 3 days and in the garden 2 or 3 days a week, combining theory & practice. Throughout the year, people from all over the world come to visit the Ommuurde Tuin organic garden, to see how a small scale (peasant) garden can give rise to an enormous biodiversity (more than 400 varieties of vegetables, fruits, tubers and herbs, including old varieties), working with nature inclusive agriculture, agroecological principles and special methods to enrich the soil as a basis for growing healthy crops. We share our knowledge about these topics and about how to earn a living form one hectare (via adding value to your product and via Community Supported Agriculture). For more info and reservations, feel free to contact us. Would you like to celebrate your graduation in the garden? Have a lunch meeting with a study group? Or have a guided tour where you can ask all your questions? Peasant-to-peasant knowledge sharing. 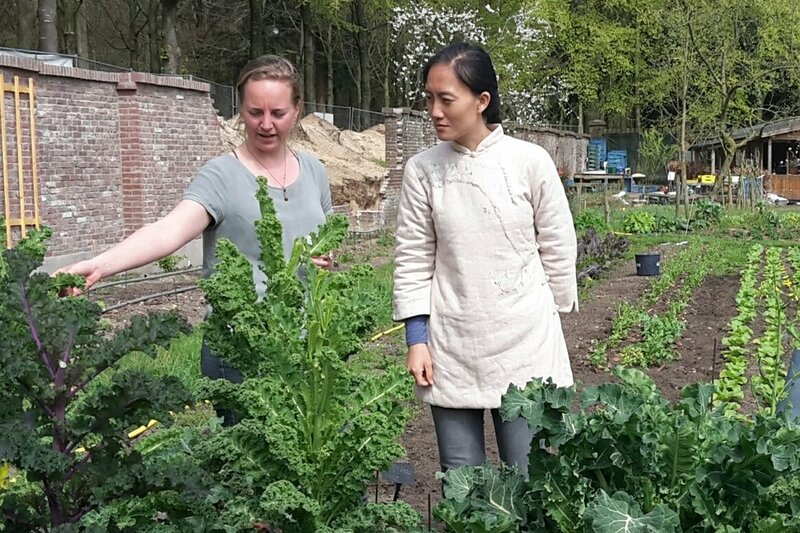 CSA pioneer Shi Yan from China visits the Ommuurde Tuin.